OPEN House - McKenzie Lake - Huge Pie Lot Backing on Park ! Posted in: Calgary Open House Saturday May 11, 2013 , McKenzie Lake Open House Sat May 11th ! STUNNING HOME with HUGE PIE LOT (9741 Square Feet) & Cedar Shake Roof on Quiet KEYHOLE Cul De Sac Cornering on Park/Playground ! Gorgeous New MAPLE HARDWOODS, freshly painted in designer colours & Popular Family plan: DRAMATIC GREAT Room with 18Ft Ceiling, gas fireplace & built-in entertainment centre, Main Floor DEN, & Laundry - HUGE KITCHEN with tons of Cabinets, Island, Pantry & Spacious Nook overlooks AMAZING Backyard & deck. DREAMY MASTER SUITE - Vaulted Ceilings, TWO-Sided Fireplace, 5 piece ENSUITE with Jetted Tub & OVERSIZED Shower with Glass Block - Two more OVERSIZED Bedrooms Up PLUS & a Guest Bedroom down. Area Amenities include Schools, Shopping, Private LAKE with Swimming, Boating, Fishing, Tennis, Beach Volleyball, & More ! 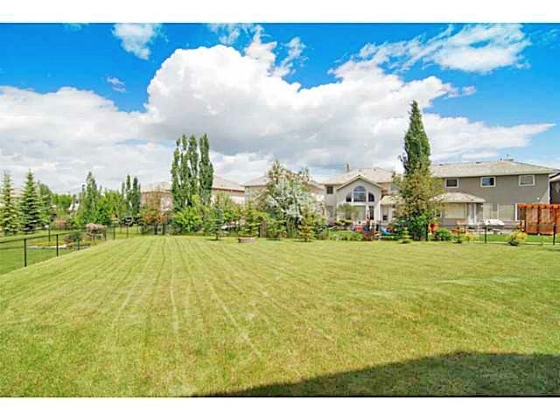 Minutes from 2 Golf Courses & Bow River Pathways - Move In & Enjoy Your Summer !